At Kloos Hauling & Demolition, we know that the commercial demolition industry gets a bad rep. We get it, to the untrained eye, we can appear loud and maybe even a bit wasteful. However, we may or may not be equipped with a few fun commercial demolition facts that are sure to shock and surprise. Spoiler Alert: We do have the facts, and after you read them, you’ll be looking at our industry in a whole new light. There are ways to cut down considerably on the amount of waste that comes from commercial demolition. In fact, the commercial demolition industry is adamant about keeping what can be recycled out of landfills. Every single project that we take on includes careful consideration and planning when it comes to waste removal. Deconstruction is a bit more involved than demolition. The demolition process involves removing any salvageable (and hazardous, for that matter) materials before destroying the rest of the building using heavy machinery. Deconstruction, on the other hand, means that the building will be taken apart in a systematic and calculated manner. Not only will salvageable materials be recycled, but pieces of the building that can be used on another construction site will be kept intact, as well. Much of the demolition work Kloos Hauling & Demolition is contracted for is, in fact, deconstruction work. The term “demolition” is merely a widely used word by the general public which describes the outcome we achieve. Furthermore, when feasibly possible, Kloos Hauling & Demolition works with local Winnipeg charities, donating furniture and deconstructed materials. Just check out the work we did at the St. Regis Hotel – hauling assets from the building to Centre Flavie-Laurent (https://www.cflc.info/) before the building was demolished. To someone that is unfamiliar with commercial demolition facts, it might seem expensive to demolish or gut interiors of buildings. The machinery alone can throw people off when it comes to cost. Remember, we recycle and reuse materials, so it’s possible for a contractor to recoup costs from the job! It’s a great reduce, reuse and recycle incentive. The bottom line is the work needs to happen. 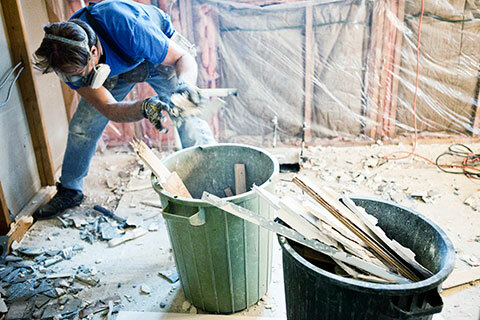 Having your team of skilled renovators doing commercial demolition work doesn’t make sense. Our crew is experienced, work efficiently, and are less expensive per hour than your team. We can also add more laborers to any given job site, further pushing the speed in which the demolition of the space will be completed. Commercial demolition can be dangerous for obvious reasons. Falling materials and an unplanned collapse of debris can lead to injury. Hard hats, steel-toe work boots, eye protection are just some of the safety clothing which needs to be worn. Individuals conducting the demolition must be aware of the possible exposure to chemicals and hazardous waste. Noise can also be a cause for concern, and anyone working for a commercial demolition company should always have earplugs. Our team of experts have years of experience conducting successful demolition. While it’s not a trade like a plumber or an electrician, there are best practices which can be learned through experience and on-the-job training. Besides our core commercial demolition service, we also have a suite of other services which compliment it. Hauling the demolition material and recycling waste commonly accompany any commercial demolition job. Also, we extend our expertise to other related tasks – like residential demolition of home interiors, garages, decks and patios, small buildings, concrete pads, sheds, and other landscaping. For the friendliest service in our industry – make it a Kloos call – 204.955.1188 or book your job through our website! Posted in Blog and tagged Commercial Demolition, Demolition, Garage Demolition, Hauling Service, Home Renovation, Junk Removal, Residential Demolition.